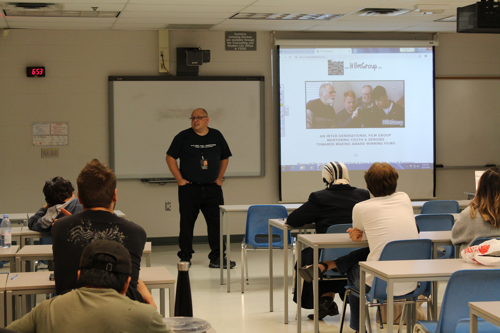 Special Guest Speaker at Fanshawe College for a Film and TV class. iFilmGroup co-founder Matthew Marshall returned to the roots of his training and education recently. 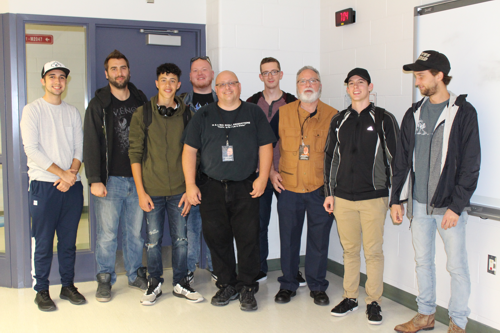 Marshall was the special guest speaker at Fanshawe College for a Film and TV class. “It was special to return to where I got my educations in film making” says Marshall. Marshall recalls the guest speakers and industry specialist that spoke to him in his college career at Fanshawe. Now several decades later it is Marshall who is the industry professional that had come to the school to be the speaker and mentor to a new generation of students studying the art of film making and production. A lot has changed since Marshall had attended Fanshawe College. The school is much bigger and more diverse. More programs are offered and the campus has expanded as well as offering a secondary campus downtown. He spoke about his experience as an award winning director in film making and about entering films into film festivals. He also discussed the iFilmGroup program and how through iFilmGroup Marshall is mentoring and teaching a new generation of film makers wanting to learn about the art of film making. Marshall felt that it was very cool to return to Fanshawe where his training all began. Fanshawe has grown in the film making course since Matthew's time at Fanshawe. “When I was at Fanshawe there was no film making course. Now it’s a program”, says Marshall. When Marshall attended back in the late 90’s he took “Audio Visual Multi Media Production” which was an over view of a number of the various production streams. From film making, photography, video production to audio recording. He returned after that two year program to do a one year post graduate course in “Broadcast Television Digital Post Production Applications”. Which was all about nonlinear editing and post production done on a computer. He was part of the first ever class for that course. He was also one of only a handful of students that graduated that first year. They did not even have their own dedicated class room at the time and shared the Avid Editing Suit with the Television students. Now many years later there is an actual room for post graduate course in non-linear editing. One of the students that was part of the class Marshall spoke to has worked with iFilmGroup. After Marshall’s presentation, both Marshall and the other co-founding member Don Hickey saw several others were interested. Marshall and Hickey sees the potential of students working with iFilmGroup making films in the future. They also sees the possibility of working with Fanshawe on the horizon on other fronts with other courses in a community partnership that helps both students as well as iFilmGroup members to gain valuable experience in acting and crew. But also to gain real life practical experience in other aspects of their lives.